Tranquil, atmospheric and skillfully composed, this photo of a woman fishing along the coast of Lebanon is one of hundreds of images of daily life in the early 20th century by Marie al-Khazen / Arab Image Foundation. Portrait of Karimeh Abbud of Palestine. When the “Here and Elsewhere” exhibition opened in 2014 at the New Museum, ARTnews magazine called it the first comprehensive survey of Middle Eastern and North African contemporary art and photography to show in New York. More impressive, the magazine said, was that of the show’s 45 artists, nearly half were women. 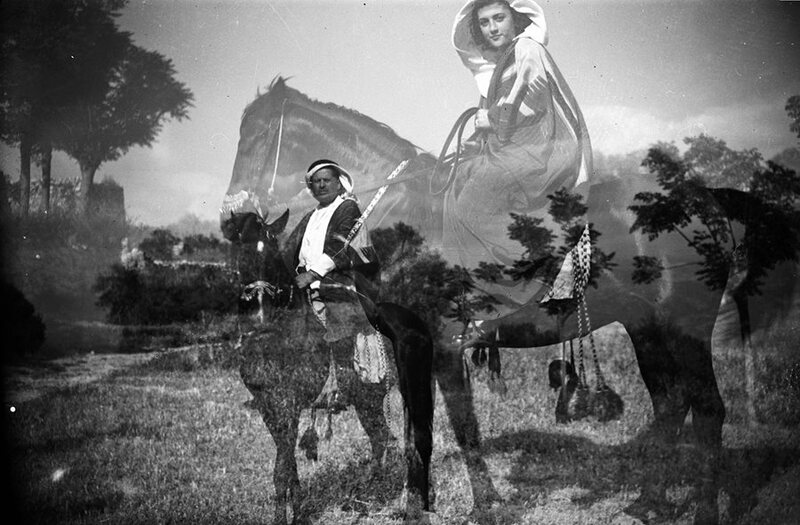 Two years later, the work of Middle Eastern women photographers was the subject of two landmark shows: “I AM,” at the National Gallery of Fine Arts in Amman, Jordan, and “She Who Tells a Story,” at the National Museum of Women in the Arts in Washington, D.C.
As groundbreaking as these were, historians are learning that women have played roles behind the camera in the Middle East since the advent of photography in the region in the mid-19th century. Some acted as assistants in photography studios in major cities of what was then the Ottoman Empire: Beirut, Jerusalem and Constantinople (today’s Istanbul). Others established themselves as individual talents in an emerging high-tech field predominantly occupied by men. Karimeh Abbud of Palestine made a name for herself in the early 20th century by shooting portraits. Lebanon’s Marie al-Khazen caught the wave of social and cultural change during the Roaring Twenties. Others such as Beirut’s Octavia Kova and Najla Krikorian, active during the late 19th century, took up the craft as members of what had become established photography families. The following essays explore the lives and careers of women whose work challenged, and continues to challenge, preconceived attitudes toward images in the Middle East—and especially those of women. They reveal that, like artists anywhere, early women photographers embraced new ideas and new technologies to chronicle the world around them—both as they knew it and as they helped imagine it for Orientalist clients. The images here, shot with achingly slow shutters on glass-plate negatives (until film came along), act as junctures where the spirit of the subject and the vision of the photographer meet. They provide a glimpse of those moments when women in the Middle East began to engage with society in new ways. “We were there,” these pictures tell us—there at the beginning of an artistic narrative that continues to unfold. Following are three historians’ perspectives. Maryam Şahinyan captured this image in the Galatsary Studio in Istanbul, where she worked from 1935 to 1985. Among the many challenges in discovering the history of early indigenous photography of the Middle East is the loss or neglect of photographic and written archives from studios due to political instability and conflict in the region. While scholars are now shedding light on the practice and use of photography in the late Ottoman Empire and post-World War i European Mandate periods, the importance of women as photographers and in studios is only now being grasped. Women were involved in photography from the time it arrived in the Ottoman Empire in the mid-19th century. In Anatolia, Turkish and Armenian female photographers started to cater specifically to Turkish women in 1919, with Turkish photographer Naciye Suman (1881–1973) leading the way. 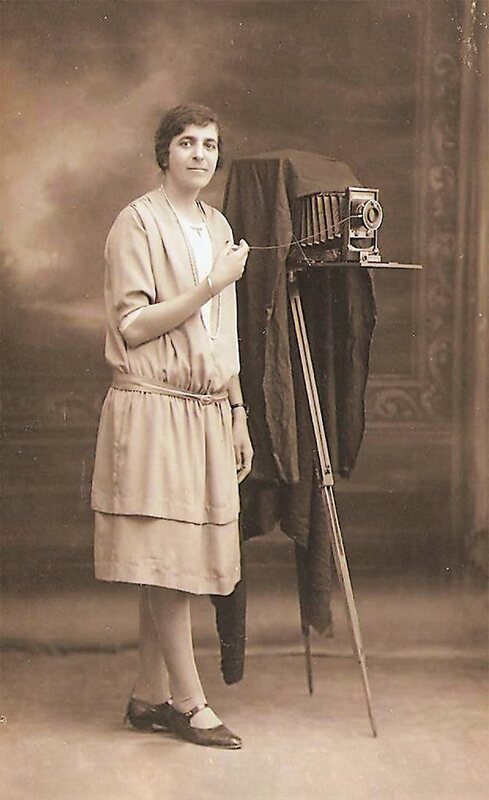 Meanwhile, pioneering photographers Semiha Es (1912–2012), a Turk, and Maryam Şahinyan (1911–1996), an Armenian, ran Galatasaray Photography Studio in Istanbul, which was operated by Şahinyan’s father, Mihran. A small number of women may have owned their own studios during those early years. Two professional female photographers from 19th-century photography dynasties in Beirut come to mind. In 1909 Dalil Beirut (Beirut Guide) listed a photography business called Studio Madame Philippe Saboungi. Philippe Saboungi was the son of Georges (Jurji) Saboungi (1840–1910), who was the first photographer in the Arab world to open a locally owned studio. Madame Philippe Saboungi seems to be Rikke, the younger Saboungi’s Danish wife. Philippe operated his father’s practice until 1916, and one can only speculate about why the name of his wife was attached to another studio at the same time. 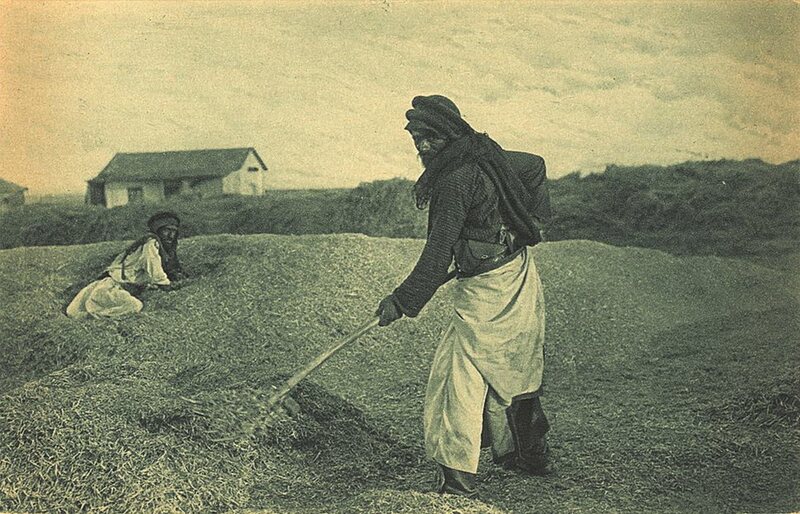 Either Sonia or Schlomo Narinsky, Ukrainian-born photographers in Palestine, photographed this harvest scene, published by the Jamal Brothers in Jerusalem in 1921. Octavia Kova is equally mysterious. The Kova Brothers, Iskander and Joseph, were award-winning studio photographers in Beirut. We can only assume that Octavia was the child of one of these two brothers. While no photographs she produced are known to exist, the fact that she worked as a photographer is attested through a postcard, perhaps made by the Beirut-based Sarrafian Brothers. The 1919 photograph of Beirut’s Gemmayzeh neighborhood shows a building with the sign to her studio that reads “photographer” above her name. The true difficulty in uncovering the history of the role women in early Middle Eastern photography stems from the fact that most women worked behind the scenes. Early Ottoman photographic studios were known to have rooms—and, presumably, photographers—for women. These studios were less artistic ateliers than commercial ventures. They often operated according to a strict division of labor, with the photographer working in the front studio handing glass-plate negatives, to others in the back taking care of developing, glossing and hand-coloring. The studio owner’s family frequently seems to have played a large role in this assembly-line production. Lydie Bonfils, from France, operated the Maison Bonfils photography studio in Beirut with her husband, Felix, beginning in 1867. It is likely that she was the one who photographed this woman, as women were generally more comfortable sitting for a female photographer. Lydie Bonfils held such a position. She ran Maison Bonfils in Beirut for decades after her husband, Felix, returned to their home in France and died in 1885. And she is not unique. Najla Krikorian (1895–1983) is understood to have been a major force behind two photographic studios in Jerusalem. She was the niece of Khalil Raad (1854–1957), who operated a famous studio on Jaffa Street, across from a studio owned by his former mentor and bitter rival Garabed Krikorian (1847–1920), one of Palestine’s pioneer studio photographers. Najla married Krikorian’s son, Johannes, in 1913, making peace between the two studio owners and then worked hand-coloring photographs taken by her father-in-law. The more we learn of family members attached to the marquee male names of famous studios, the more we realize that Najla’s story is more emblematic than unique. The sheer output of postcards produced in Beirut during the first half of the 20th century by the Sarrafian Brothers, whose branches stretched throughout Lebanon, Palestine and Syria, suggests that the women in their families, too, were active participants in their business. After all, Abraham Sarrafian (1873–1926) and his wife had three daughters and two sons. His brother Boghos (1876–1934), and his wife had a daughter and two sons, and Samuel Sarrafian (1884–1941) and his wife also had three daughters. Margo Abdou elicits similar speculation. Before Karimeh Abdou established her own studio in Bethlehem in 1932, Margo assisted her brother David, who owned a studio in Palestine, and she ran it whenever he was traveling. Equally interesting are Shlomo and Sonia Narinsky, Ukrainian-born photographers in Palestine who sold their photographs through the Jamal Brothers. 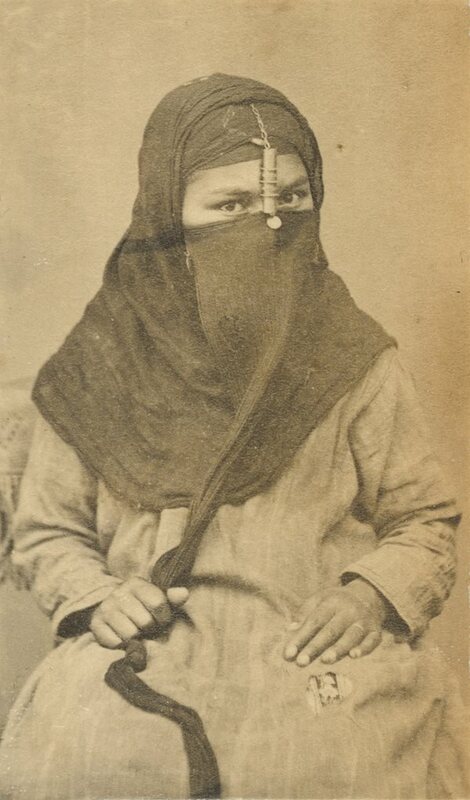 In the late 1800s, the Jamal Brothers published and marketed photographs of Palestine, including a large number of pictures of Jews native to the region, partnering with the Narinksys. When we speak of Arab photography, we should expect that behind every male photographer is a woman. While the origins of the photography of Middle Eastern women remain to be explored more thoroughly, it is clear that Arab, Armenian and expatriate women were central to the production of indigenous photography in the Middle East from its earliest days. Stephen Sheehi is the Sultan Qaboos bin Said Chair of Middle East Studies at the College of William & Mary. 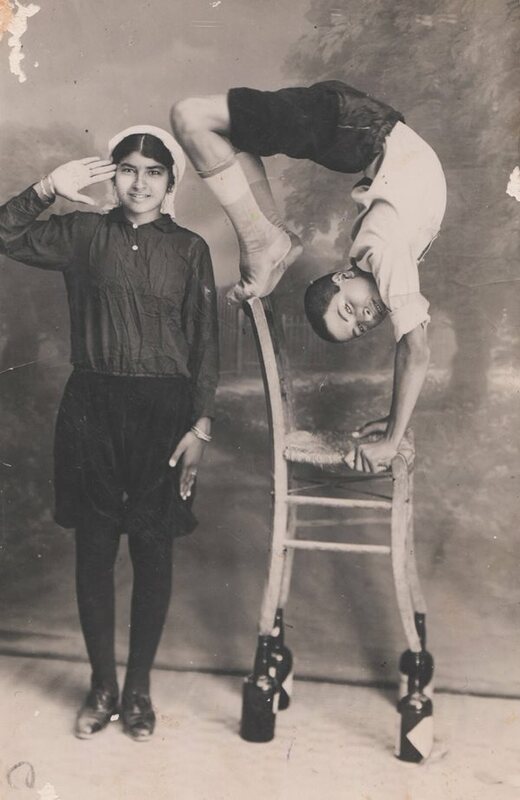 Karimeh Abbud described herself as the “only national woman photographer in Palestine.” She was known for her family photos and for playfully posing her subjects, as in this 1921 picture of children in a Jerusalem orphanage. Karimeh Abbud practiced photography from 1915 to 1940, a time when even male photographers in Palestine were few. She was known as the only portraitist who specialized in photographing women who might have chosen not to sit for photos in studios run by men. She was born in Bethlehem in 1893. Her father, Said Abbud, the city’s Lutheran pastor, hailed from the village of Khayam in the upper Galilee region (now Southern Lebanon). He studied at the Schneller Orphanage in Jerusalem when the region was still under Ottoman rule, before the borders between Palestine and Lebanon were drawn by the French and the British after World War i. During the first few years of her life, Karimeh lived in the Galilee, where her father was a pastor in Nazareth and the village of Shafa Amer. In 1899 the family moved to the Bethlehem area, where she spent most of her life. Although her photographic career largely unfolded in British Palestine, it was grounded in techniques that had developed in the Ottoman world for half a century. The first professional photographers, Armenian siblings Vichen, Hovsep and Kevork Abdullahyan, established the Abdullah Frères studio in Istanbul in 1858; it was followed by a number of other Armenian studios throughout the empire. The Abdullah Brothers’s claim to fame was a result of their role in a massive survey of the Ottoman lands at the request of Sultans Abdülmecid and Abdülaziz. Closer to her home, the first school of photography had been established in Jerusalem in the early 1860s at the Armenian compound of the Cathedral of Saint James. Around 1885 Garabed Krikorian, who had trained at the school, opened the first photographic studio in the city just outside the Jaffa Gate and mentored other young photographers in the area. He specialized in studio photography, while his apprentice Khalil Raad became known for his landscape and social photography. Did Abbud learn photography from Krikorian or one of his apprentices? The answer to that question is not known. Considering the lack of opportunities for women in that field at the time, however, it is likely that she trained with someone in her neighborhood. We know of five Lutheran photographers practicing in the Bethlehem area then. We also know that one of her few photographs (and the only one to show her with a camera) was taken by one of them, Jerusalem photographer Militad Savidas, who also photographed in the Bethlehem and Ramallah areas. She may have trained with him or any of his compatriots. Abbud devoted a great deal of her work to portrait photography. In her collection, we find a large number of photographs of her sisters and cousins, some partially hand-colored, which suggests that she used them as subjects for training. She also practiced family photography, as her collection of images of family outings and social occasions attests. Her newspaper advertisements highlighted the fact that she was the “only national woman photographer in Palestine.” Her studio was in her home in Bethlehem, and it is likely she had much more access than her male peers to family homes and to women’s activities. In her portraits, Abbud used the poses and backgrounds common at the time, showing her clients seated with flowers in their hands, for example. However, she was less rigid than her male peers in her sittings. Her subjects typically appear at ease, even playful, and thanks to them, we can glimpse middle-class Palestine as it wanted to be seen. While other photographers catering to tourists and pilgrims were producing biblical scenes and Orientalist photography, Karimeh Abbud was letting her patrons show who they really were. Issam Nassar is a professor of history at Illinois State University. During the early French mandate in Lebanon in the 1920s—a period of major social, political and economic changes that included a rising women’s movement in Syria and Lebanon—Marie al-Khazen, the daughter of an aristocratic family, took to recording her everyday life in her northern Lebanon village, Zgharta. Not with a pen, but with a camera. Then in her mid-20s, al-Khazen developed an interest in the imported, lightweight, user-friendly Eastman Kodak camera. Clicking the shutter to capture whatever shot she deemed worth the effort, she left more than 200 six-by-nine-centimeter negatives that are carefully preserved in the archives of the Arab Image Foundation in Beirut. Al-Khazen likely printed most of her photographs in a darkroom she had constructed in her family’s mansion in Zgharta. In one of her photographs, she staged herself and her sister as men: Was she expressing her desire to be looked at as a woman who shared equal power with the men of her society? While she left no writings to directly answer such questions, her images seem to make just such a statement. Marie al-Khazen broke new ground in Lebanon beginning in the 1920s, photographing women in activities usually associated with men. In this double exposure, the female rider looms over her male counterpart. Within a climate of a rising intelligentsia among Lebanese women, activist writers such as Anbara Salam, Salma Sayegh and Adila Beyhum voiced concerns about the image of a changing, modern woman. Their agenda, as reflected in the increasingly important women’s press in the 1920s, focused on the construction of this new woman. Through their writings they promoted an image of the new woman as both an educated mother and the ideal housewife supporting her husband. Al-Khazen, however, was neither a mother nor a wife, and as her photographs demonstrate, she had other concerns. In many of her photos, she and her female friends are seen partaking in activities associated with men: smoking cigarettes, driving cars, fishing and visiting Lebanon’s tourist landmarks. She also practiced taxidermy, and she was a passionate hunter, according to her relatives. Al-Khazen’s photographic construction of the new woman went further than the writings of Salam, Sayegh or Beyhum. She created an image of this woman as an independent individual who refused to withdraw into domestic duties and cater to the needs of the man of the house. Perhaps masculinity seemed more attractive to her than femininity because it connoted power, liberty and independence. Her photographs stand out because she used the medium to imagine an alternative feminine identity. She raised questions concerning cultural assumptions about gender roles. 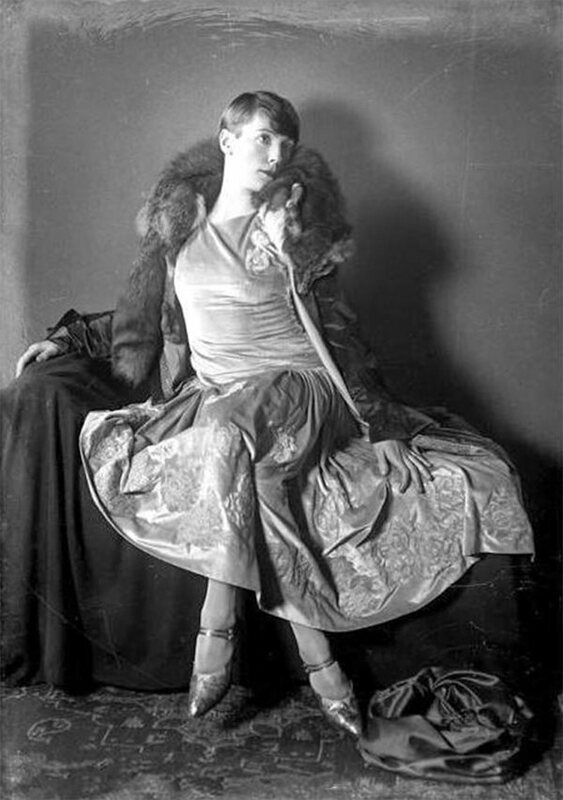 She contested the assumptions of the local women’s press of the 1920s about the female figure as naturally feminine. For the early 20th-century bourgeoisie, authority and control exemplified masculinity, while obedience, love and affection represented femininity: Al-Khazen offered up the possibility of a masculine femininity. Her photographs not only re-presented femininity for her time, but also presented a new vison of women through new narratives. Notwithstanding the fact that such a redefined femininity was, and still is, perceived as negative and threatening by many, most of her work highlights the happiness and personal interests of her subjects. Al-Khazen’s photographs can be read as a rejection of assumed gender roles and an attempt to immerse herself in masculine public spaces as opposed to feminine private spaces—challenging the patriarchal status of her brother, father and uncle. A serious amateur photographer, al-Khazen recorded her life as it was happening, improvising and experimenting in domestic environments during family trips, taking both candid and carefully constructed photographs of her subjects. She controlled the shutter speed of the camera, cropped her images and studied the lighting and positioning of her subjects. In these and other respects, her work anticipated the technical skill and artistically inspired vision of modern, professional art photographers. Yasmine Nachabe Taan is a professor of design at Lebanese American University in Beirut.